Recently museums have mounted more exhibitions from their permanent collections, revisiting their archives and breathing new life into years’ worth of holdings. This generation’s artists are also revisiting the discourse of materiality, with nontraditional materials finding their way into their compositions–perhaps out of necessity, or maybe as a response to a collective loss of intimacy through lives lived online. NOT THE WAY YOU REMEMBERED explores the acts of collecting, selecting, arranging, and giving value through the work of 16 up-and-coming artists, most living in New York City. With the process of selection and presentation often made explicit in the work, the items assembled project “specialness” or preciousness, while often lacking that quality inherently. Situating the ordinary, banal, familiar or personal into grander narratives activates new sites of tribute and remembrance, making the argument that anyone entering the space of a museum has the capacity to translate and adapt their experiences therein to their lives and personal histories. 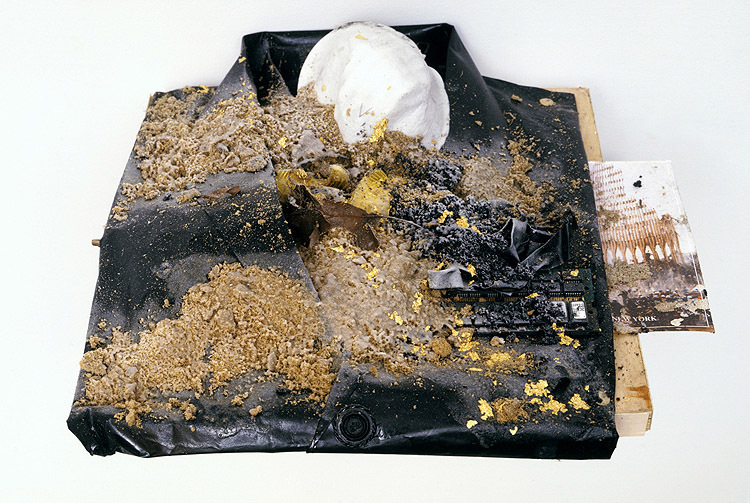 Each artist has a very personal orientation towards the materials comprising their work. Chicago-based photographer Jason Lazarus’s ongoing project, Too Hard to Keep, is a collection of photographs submitted to the artist by mail, online, or at drop-box locations. As the title of the project suggests, these cast-off images were deemed “too hard to keep” by their owners, who were, however, just as reluctant to throw away or destroy the photos. The project also begs a complex negotiation of Lazarus’ roles as artist, non-judgmental receiver of very personal items, and finally curator. Each individual photograph presents a disrupted narrative, but through their group display, the artist creates new connections and stories. Agathe Snow’s 2007 exhibition No Need to Worry, the Apocalypse has Already Happened…when it couldn’t get any worse, it just got a little better involved the artist collecting detritus around her apartment and combing the East River, prematurely acting out a post-apocalyptic battle for goods necessary for survival. The resultant assemblages and caption texts, which Snow compiled from non-narrative fragments of newspapers printed at the time, mark place, time, and community, acting simultaneously as time capsule and fictional artifact. Bryan Zanisnik is best known locally for his performances involving his parents, and photographs in his childhood home in Springfield, New Jersey, with sets constructed from materials sourced from familial effects. In Preserve, a 2009 2-channel video, Zanisnik’s father acts as a docent at a taxidermy museum in Maine, and gives a tour of the family home, treating elements found there as heirlooms or of heightened significance. For.Zanisnik, the family as material gives new, literal meaning to relational practice. Over the last several years, Barb Choit has operated the Division Museum of Ceramics & Glassware, a physical and photographic collection of discarded and donated broken glassware and ceramics, destroyed either in performance or by misadventure. A trained archivist and curator, Choit’s “accessions” borrow museological language to re-inscribe the objects documented with historical value, regardless of their states of complete disrepair and compromised use value. The participating artists in REMEMBERED locate meaning through familiarity. Relation and recognition engender understanding and interaction beyond the interpretative apparatus set forth by museums. In part, the artists here are reclaiming the act of curating–selecting and re-presenting objects of personal significance with the greatest care. As artists are again delving into discussions of materiality through appropriating inexpensive, found, or personal objects in their work, they are using the power of association to invest ordinary objects with emotional and intimate value. The resultant arrangements begin to collapse the distance between spectator and object in the sometimes alienating space of a museum, reconnecting viewers to the physical world of memory and experience in an age when the virtual often displaces the real. REMEMBERED seeks to re-examine the ways viewers can arrive at the meaning of an artwork, irrespective of its components, institutional context, or seeming insignificance. Artists since the late 1960s have been responding to the very notion of the museum. While engaging in their own explorations of time and place-marking—take for example Felix Gonzalez-Torres’ ephemeral installations or Fred Wilson, Renee Green, or Michael Asher’s archival interventions—pushing the limits of materiality while speaking truth to the power of museums to shape the experiences of their visitors. From Arman’s response to Yves Klein in 1960, to Ilya Kabakov’s The Man Who Never Threw Anything Away, through the accumulative works of Thomas Hirschhorn and Kai Althoff, what governs what can be considered junk has often hinged on context. Belgian conceptual artist Marcel Broodthaers’ installation, Museum of Modern Art—Department of Eagles (1968-72), finds the artist presenting artifacts, often of his making or finding, organized chronologically into departments in a manner similar to how museums present their holdings. He also employed a system of notation (fig. ), which ascribed archival significance to the ordinary objects contained therein, thus forging a narrative steeped in fictive history and curatorial parody. While Broodthaers’ work functions as institutional critique, the work also serves to highlight what can constitute an art object from a strictly material standpoint and whether everyday objects can transcend the trappings of banality. The artists in this exhibition, all under 40, have adopted certain strategies from their forebears and are initiating new dialogues around worth and significance. Digging deeper, a viewer may find that the elements of an artist’s composition may have a psychic, social, cultural or historical resonance. One man’s trash may be another man’s treasure, or, in this case, another museum’s as well. NOT THE WAY YOU REMEMBERED is curated by Queens Museum curatorial fellow Jamillah James. Artists in the exhibition include Taylor Baldwin, Clifford Borress, Barb Choit, Brendan Fowler, Ted Gahl, Rashawn Griffin, Faten Kanaan, Zak Kitnick, Jason Lazarus, Lauren Luloff, Dave Murray, Amanda Ross-Ho, Jean Shin, Hayley Silverman, Agathe Snow, and Bryan Zanisnik. The exhibition will be on view from Sunday, April 10, 2011 through August 14, 2011.